One of the prettiest snowshoeing outings you can do in Alberta has to be the one to Chester Lake in Peter Lougheed Provincial Park, Kananaskis Country. The five kilometre trail to Chester Lake climbs steeply for the first few kilometres but once you reach the large meadow – one where you’ll find fabulous mountain views, the worst of the aerobic workout is behind you. From the meadow it’s a gentle climb through the trees to another smaller meadow before reaching Chester Lake itself. Do make the side trip, even though it’s a steep one – to Elephant Rocks. Giant sized boulders have been dropped helter- skelter and the views from here are magnificent. The snow conditions when I did this hike 10 days ago were excellent. Since then, it’s warmed up considerably and there hasn’t been much in the way of fresh snow. It would be worth stopping at the Peter Lougheed Provincial Parks office on Highway 40 to get an updated trail report. Most people drive to the trailhead via Highway 40 from the Trans-Canada Highway – and not up the Spray Lakes Road from Canmore. There is a large parking lot at the trailhead, located on the east side of Smith Dorrien-Spray Lakes Road. It’s about 20 kilometres north of Highway 40. From Calgary, allow 90 minutes to two hours for the drive, depending on weather conditions. 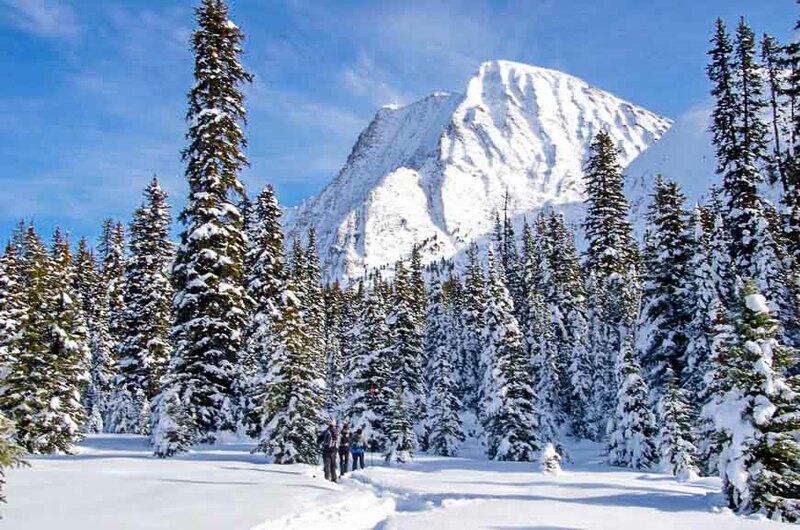 Snowshoeing to Chester Lakes is one outing that should make you smile in winter. Disclosure: This post includes an affiliate link. If you purchase an item through this link, I receive a small percentage of the sale at no extra cost to you. This helps me continue to write free content like the article you are reading. I only recommend products or experiences I personally use or see a use for. Hi Leigh, this snowshoeing adventure looks glorious. The ice are so breathtaking. My recent trip in Antarctica made me possessed by ice and your lovely photos just gave me a good dose of it. @Marisol Antarctica – I’ve missed something and can’t get over how many interesting places you and Keith visit every year. Snow and ice can make for very interesting photographic opportunities. @Aleah I think if you were bundled up that you’d fall in love with this scenery. And I guarantee on even the coldest day you’d be warm within 15 minutes. Wow! This looks so beautiful. Maybe I’ll have to reconsider my attempts to avoid winter sports. How hard is it to snowshoe? @Cindy Trust me – if you can walk you can snowshoe.